Whooops! Careful, Paula, about payback! You have the most boop-able nose of all the Dearborn brood! Did I say Paula? I meant PEARLA,of course. Boop! Booping kitty noses is the best! Obviously, Pearla is playing the immortal "Got your nose!" joke on her brother. But webbthistle is right - of all the kitties, Pearla's got the most boopable nose in the lot. Seems as if they are not letting the digestive problems slow them down. Beware of siblings - they have pointy parts they like to stick in you!!! This is torture, not being able to get in on the booping! Apparently Perla doesn't take sass from Sheldon. 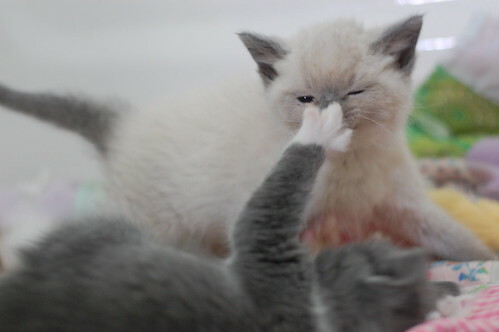 That seems more like a fwap (a la kitteh smackdown) than a boop! Well, no matter what it is, it's CUTE!